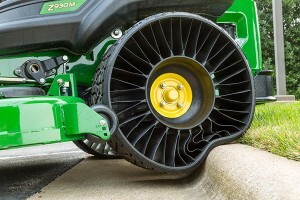 The MICHELIN X® TWEEL® TURF™ is an airless radial tire sold exclusively for John Deere ZTrak™ 900 Series models. Unlike traditional pneumatic tires, the MICHELIN X TWEEL TURF virtually eliminates tire downtime and is nearly maintenance free. The X TWEEL TURF, offers the advantages of no maintenance, no compromise and no downtime. The airless radial construction means there is no air pressure to maintain. High strength, poly-resin spokes carry the load and absorb impacts, resulting in excellent operator comfort. Treads last up to three times longer than pneumatic tires and the X TWEEL TURF cannot go flat – not ever.